Five years have passed since Lo Wang shattered the alliance between his deceitful former boss and the ancient gods of the shadow realm. Despite noble intentions, Lo Wang’s efforts to annihilate the darkness corrupted the world, creating a strange and savage new order where humans and demons live side by side. The once feared warrior now lives in the shifting wildlands outside the reach of his enemies and the neon glow of Zilla’s cybernetic metropolis, scratching out a meager existence as a hired sword for the local Yakuza clans. When a simple mission goes wrong, Lo Wang is drawn into a volatile conflict between a brilliant young scientist, a controversial cult leader, and a terrifying new drug known as Shade. The sharp-tongued hero must once again wield lethal blades, staggering firepower, and archaic magic to purge the world of evil. Blades and Bullets – Lo Wang delivers his own brand full throttle brutality with an expanded array of over 70 lethal blades and explosive firearms to overcome the demonic opposition. Become a whirlwind of steel and blood with razor sharp katana, short swords, crescent blades, and hand claws or unleash a hellish symphony of ornate firearms to decimate your enemies. Four Player Co-Op – Battle through the expansive campaign alone or team up as a four-player typhoon of destruction online in campaign co-op mode. Tackle challenging primary missions or thrilling side quests while maintaining your own ninja style with customizable armor, items, and valuable loot from your triumphs. 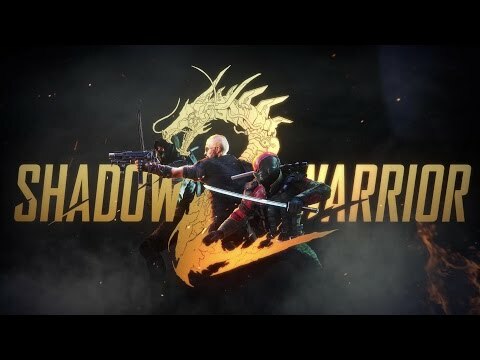 Procedural Environments – The breach between the human and demon realms created an interdimensional hernia resulting in constant shifts to the world of Shadow Warrior 2. Procedurally generated landscapes and paths bring new twists and turns to once familiar terrain and routine missions. Brutal Damage System – Choose your weapon based on the situation at hand and then dismantle everything that stands in your path with an advanced gore system. Use precision blade strikes to separate limbs and heads or switch to heavy ordinance and blow a hole right through colossal beasts. Custom Upgrade System – Upgrade weapons in your arsenal with up to three stones at once to improve performance or augment them with devastating elemental effects. Collect karma, amulets, and armor to enhance Lo Wang’s power and shift his death-dealing artistry into overdrive. Grabbed it earlier today. Will be a good game to boot up while I wait for Assassin's Creed: Odyssey to officially launch for us poor Standard Edition players.